SuperAdobe is a powerful tool in the fight against the global housing crisis. It is currently used across the globe in ways that have helped rebuild communities facing housing crisis. The education provided by CalEarth has empowered hundreds of people to found humanitarian projects for those in need. Over the past year and a half, we have developed the "Duffel Bag Dome"
We are now ready to mass produce these kits and send them out all over the world with trained builders to build and teach in communities that need this knowledge but cannot access it easily. We always say, if it is not accessible, it is not sustainable. Please help us make this a reality by making a donation to CalEarth. After the 2010 earthquake that devastated Port-au-Prince and surrounding cities, CalEarth was invited on a research trip to design a possible temporary housing alternative for individuals who lost their homes and were living in tent villages. After speaking with many families living in these camps, we returned a designed a structure based on their requests. As an alternative to our single dome designs, this structure includes a 10 foot main dome with 3 small apses, one for a sleeping nook, one for a cooking surface, and one for storage. It also includes a rocket stove, a recycled door made from pallets, and small window openings using PVC pipes. See more images of the "Haiti One" prototype here. After the earthquake in October 2005 in northern Pakistan, CalEarth partnered with the SASI Foundation to form the CalEarth Pakistan initiative. According to SASI, hundreds of refugees were trained hands-on, as well as national and international NGOs and military emergency relief units under the direction of Shahid Malik Shahid and Khorram Shroff. The needed rolls of bags were distributed to the refugees. Since the structural system passed tests in California, the shelters were approved by the authorities in Pakistan. Costs for the training shelters were similar to the UNHCR shelters (see above). 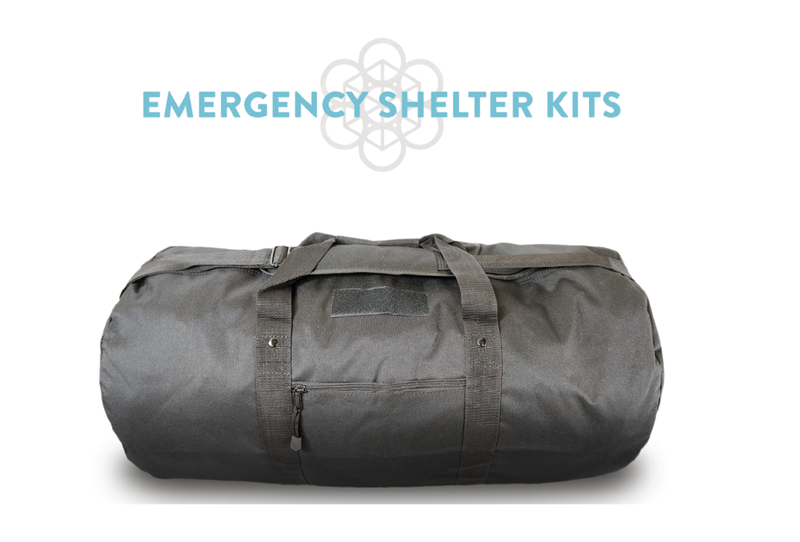 Downloadable PDF with step-by-step instructions for building an emergency sandbag shelter. Video from Oxfam in the Middle East about a Superadobe project built by refugees in the Za'atari Refugee camp in Jordan. Shared on World Refugee Day 2018. Africom joined a local community to build a SuperAdobe Eco Dome with communities in Djibouti, Africa. "The mission is really to bring the community together. Give them a sense of ownership in this area. It’s been a great opportunity to work side by side with the villagers. Things as simple as shoveling dirt together breaks through so many cultural barriers. I don’t know their language. I knowa few words but we’ve developed friendships. We;ve broken through the language barrier just by working side by side." The Konbit Shelter Project is composed of a small group of artists and builders dedicated to reaching out to the Haitian communities devastated by the 2010 earthquake. They have built multiple SuperAdobe structures, each capable of housing 4-5 people and connected with local community members to raise funds to rebuild schools, clinics and community meetings spaces.